Who Has Pitched the Dazzy-est in 2015? Sadly, the 2015 baseball season is nearing the halfway point. Three more months and the playoffs begin. Following the World Series, we must be content to do, as the great Rogers Hornsby said he did every offseason, stare out the window and wait for spring. We can, however, take some time now to analyze the 2015 Dazzy Vance Award competition. You’ll recall last year that I instituted this award amid much pomp and circumstance. It is named in honor of Vance, of course, the late, great right-hander for the Brooklyn Robins (forerunner of the Dodgers). 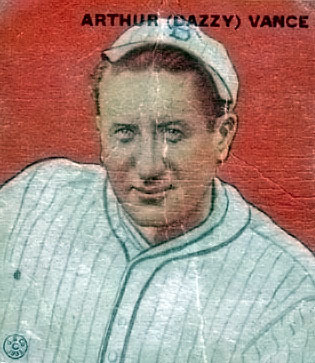 Vance, a late-bloomer, dominated several pitching categories in the 1920s, including K/BB ratio (N.L. leader eight times), K/9 ratio (eight times) strikeouts (seven times), FIP (seven times) and H/9 ratio (four times). He also led the N.L. in ERA three times, ERA+ three times and wins twice. In 1926, the Nebraska native went 28-6 with a 2.16 ERA and won the league MVP. Also, the winner should be someone with Dazzy Vance-type stats. He should be a guy who strikes out a lot of hitters, but who doesn’t walk many. Soft-tossers and wild throwers need not apply. Clayton Kershaw of the Los Angeles Dodgers won the award the last year. He was the Dazzy-est. The left-hander (The winner can be a lefty or a right-hander) led the N.L. win wins (21), ERA (1.73), ERA+ (201), FIP (1.81), WHIP (0.857), K/9 (10.8) and K/BB (7.71). This choice was easy. How ‘bout this year? The top candidates include (in no particular order) Max Scherzer of the Washington Nationals, Gerrit Cole of the Pittsburgh Pirates, Matt Harvey of the New York Mets, Michael Wacha of the St. Louis Cardinals, Shelby Miller of the Atlanta Braves, Cole Hamels of the Philadelphia Phillies, A.J. Burnett of the Pirates (Suddenly, he isn’t walking batters. ), Zack Greinke of the Dodgers, and Kershaw, the incumbent. I won’t go over everyone’s qualifications. You can go to baseball-reference.com to look up all the numbers. I will say that Scherzer looks to be the frontrunner. He leads the N.L. in innings pitched (110.1), FIP (2.01), WHIP (0.789), H/9 (6.0) and K/9 (9.29). He is second to Clayton Kershaw in strikeouts (130), second to Zack Greinke in ERA (1.79), second to Bartolo Colon (?!) in BB/9 (1.142). Recently, Scherzer put up Dazzy-like back-to-back performances. He tossed a one-hitter followed by a no-hitter, just the fourth pitcher to throw back-to-back shutouts while allowing one hit or less. Vance did it in 1925.